Dealing with the loss of a loved one, friend or colleague can sometimes be more challenging than losing someone close to you. There’s more confusion over how to engage with the family and end-of-life services. What’s appropriate? What’s expected of you? What should you do? Whether the deceased was a co-worker, former classmate, or maybe even the sibling of a close friend whose time came far too soon, the ripples of loss affect those who are “once removed” from the deceased as well. Are you dealing with the grief of loss and unsure what to expect? Are you planning to attend services but don’t feel confident about customs or protocols? 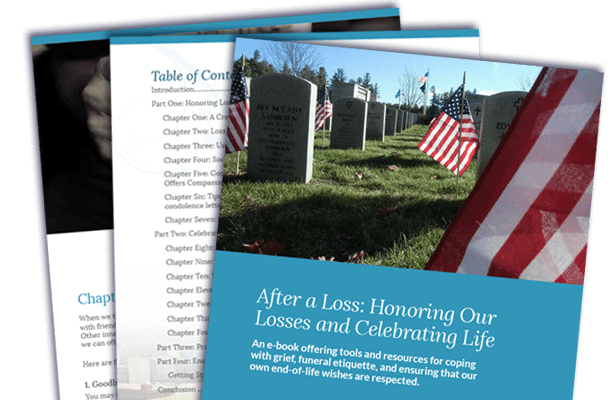 Phaneuf Funeral Homes & Crematorium has developed a collection of tools and resources in the form of an e-book, entitled After a Loss: Honoring Our Losses and Celebrating Life. Our e-book lays out exactly what you need to know—here are just a few benefits of taking the time to read it. One of the most difficult aspects of dealing with a death—especially if it’s removed in one way or another—is knowing what to expect in the aftermath. From wakes and funerals to new concepts like social media etiquette, death makes many of us feel inept. Our e-book helps to clarify exactly what to expect after someone in your life has passed, whether you were close to the person or they were an acquaintance. While pinpointing guilt’s source isn’t always easy, it can easily stem from feeling as if you’re “not doing your part” in paying respects or helping out after a person has passed away. Knowing how to act appropriately can significantly reduce feelings of guilt. The grieving process shouldn’t be rushed, but you also owe it to yourself to ensure that it doesn’t get “stuck,” either. Even if you didn’t know the person who died particularly well, grief may hit in ways that you didn’t expect, potentially even leading to bouts of depression and anxiety. When you have a strong handle on the process of death and what happens afterward, potential hurdles affecting how you grieve should disappear. Interested in learning more about how to cope with grief, funeral etiquette and more after a loss? Download our new e-book today!